Good news stories are few and far between these days but the acquisition by the Rosapenna Hotel & Golf Resort of the 370 acres formally known as St. Patrick’s Golf Links adjoining the 800-acre dune system at Rosapenna in northwest Donegal is definitely one of them. In what is believed to be a deal worth between €1m and €1.5m for the former NAMA property, proprietor Frank Casey now has 36 extra links holes to go with the 45 at the resort, giving Rosapenna a grand total of 81 links holes and making the picturesque enclave on Sheephaven Bay the largest links golf destination in Europe after St Andrews. View of Rosapenna’s new No. 3 Links & No. 4 Links along Sheephaven Bay, Co. DonegalRosapenna - which features the Old Tom Morris Links, the Sandy Hills Links, the No. 3 Links, No. 4 Links and the Coastguard Nine - has a long illustrious golfing history dating to 1891 when Lord Leitrim brought Old Tom Morris of St Andrews to design the first links. Golfers on the Par 3 14th green on the Old Tom Morris Links in 1908. It opened for play in 1893 and a timber structured hotel was also built soon afterwards, accommodating golfers from all over Europe and making Rosapenna the oldest golf resort in the country. In 1906 professional golfers Harry Vardon and James Braid both travelled to play at Rosapenna and they made some alterations to the course, adding length and more detailed bunkering. Aerial photo of the Rosapenna Hotel & Golf Resort (click to enlarge) along Sheephaven Bay including the Old Tom Morris Links, Sandy Hills Links, No. 3 Links, No. 4 Links and Coastguard Nine.The three golfers have 16 Major Championship titles between them with Old Tom winning four Open Championships), Braid five Opensand Vardon six Opens and one US Open. The back nine of the original layout crossed the main road on a number of occasions and on September 1st 2009 the Strand Nine opened as the new front nine to link in with the original holes 2-10 (Valley Nine) which are now played as the back nine of the Old Tom Morris Links finishing at the new Golf Pavilion (clubhouse) which opened on May 1st 2005. This pure links layout is now ranked No. 34 in Golf Digest Ireland’s Top 100 Course List. Exhibition Match at Rosapenna, Co. Donegal on the 8th of June 1910. From left to right: George Duncan (1920 Open Championship winner), Alexander Herd (1902 Open Championship), Tom Ball (Runner up in the 1908 & 1909 Open Championship) and Harry Vardon (Open Champion in 1896, ‘98, ‘99, 1903, ‘11 and ‘14, US Open in 1900).Rosapenna’s newer championship course, the Sandy Hills Links was designed by Pat Ruddy and opened for play on the 25th of June 2003. It has steadily risen up the many ranking polls since and has just been ranked No. 42 in Great Britain & Ireland’s Top 100 List by Golf Monthly Magazine 2012, with only nine Irish courses above Rosapenna’s Sandy Hills Links in Golf Monthly’s Top 100 in GB&I it is effectively ranked 10th in Ireland. Jack Nicklaus on a design visit to St Patrick’s on 12 June 2006. The Gold Bear fell in love with the site and is reputed to have spent 16 hours there following the 2006 Open at Royal Liverpool - an eternity by his standards.Jack Nicklaus, winner of 18 Majors including three British Opens, was commissioned to redesign the 36 holes at St. Patrick’s Golf Links and work did start in November 2006 after Relton Developments had purchased the two courses from the Walsh family of the Carrigart Hotel, who had owned the property since 1976. An archive image of St Patrick’s from 2006.“The land and the dunes comprising St. Patrick’s is what Ireland golf is supposed to be - raw, natural, wild, windy, with bunkers, carved and created by Mother Nature,”said Tim Kenny, executive vice president of Nicklaus Design. The Par 4 5th hole on the Sandy Hills Links at Rosapenna. Photo by Larry LambrechtAll redesign works by Nicklaus Design ceased at the end of December the same year. The first of the two courses, Maheramagorgan, was originally designed by Eddie Hackett in 1982 but construction did not begin for 11 years and was not fully completed until 1996 - the last piece of sod was laid two months before Hackett’s death on October 31, 1996. The second course, Trá Mór, was designed in 1996 by former Royal County Down assistant professional Joanne O’Haire, and is said to be the only course in Ireland designed by a woman. Sunset behind Muckish Mountain overlooking Sheephaven Bay.Rosapenna has been owned and operated by the Casey family since 1981 and has seen the resort grow from one 18 hole golf course with a 40-bedroom hotel to the resort as it is today, boasting a four-star, 66-bedroom hotel, a leisure centre, Golf Pavilion and now 81 links holes as well as the practice facility with its own 12-hole, Par-3 course. “We are very excited that we can now extend golf at Rosapenna beyond what we know as ‘the top of the Valley’ along the shores of Tramore Beach,” said Frank Casey Snr, resort owner and operator for the last 31 years. “The dunescape is some of the finest in the world and very similar to what we already have. Rosapenna’s continued investment in links golf in Ireland is welcomed at a difficult time for the golf industry and represents a continued commitment to the local area by the Casey Family. The developement of the St Patick’s site can only be good news for Irish golf tourism but it remains to be seen who will get the design brief. View of the Valley at Rosapenna along Sheephaven Bay with the sleepy fishing village of Downings in the background.Ryder Cup captaincy hopeful Paul McGinley and his family tried to buy a site near St Patrick’s several years ago (the lands marked links 3&4 on the map at the very end of the beach) but failed to get planning permission. He is certainly a man with close ties to the area as his father Michael hails from Dunfanaghy and his mother from Rathmullan. And it appears that the St Patrick’s Links, which was part of NAMA portfolio, will finally become another great addition to links golf in Ireland. How the holes at St Patrick’s will be redesigned or incorporated into the existing holes at Rosapenna remains to be seen. However, they will be redeveloped at some stage and could tie in with the Old Tom Morris Valley Nine that plays along the beach. The list of architects hoping to get the job will be a long one. 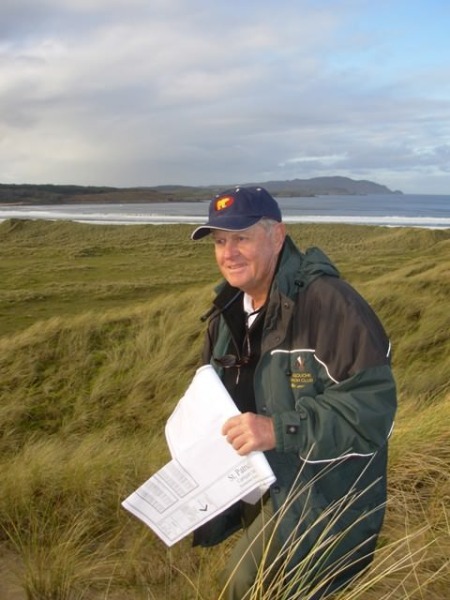 But Tom Doak, designer of courses such as Pacific Dunes in Oregon or Barnbougle Dunes in Australia, is certainly keen. He said as much on the Golf Club Atlas forum today. Newtownstewart's Eugene Corry won the prestigious St Patrick's Links Plate on the Old Tom Morris Links at Rosapenna on Saturday, bringing down the curtain on 2014 for the Northwestern Golfing Alliance.